Carslogie House - Summerstrand Accommodation. 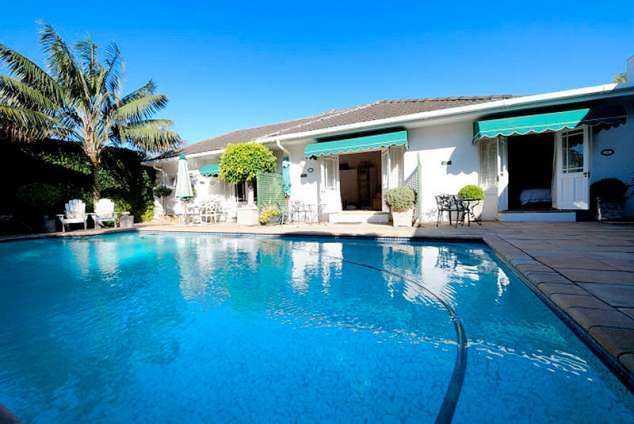 Located in the upmarket beachfront suburb of Summerstrand, Carslogie House offers luxury 5 star bed & breakfast accommodation with individually decorated and fully equipped en-suite double rooms, shaded private patios and large guest swimming pool. The furnishings of Carslogie House, combined with the personal attention of your host, Christine Landman, ensure that guests experience luxury bed & breakfast accommodation in the relaxed atmosphere of Port Elizabeth, South Africa. The guest house is situated only 200m from Port Elizabeth's popular beach front, is on the main bus route to all major attractions and is just a few minutes away from Humewood Golf Club, is just 5 minutes away! Five rooms with luxury furnishings and attention to the smallest detail, guarantee guests great comfort in a relaxed atmosphere. Beds are dressed with luxurious percale linen. The rooms are nestled in a beautiful landscaped garden setting around a large sparkling pool. Private entry to all rooms. TV with M-Net & Satellite Ceiling fans / heaters Telephones with separate internet connection Full English or continental breakfasts are creatively prepared and served in the stylish dining room adjoining a cosy reading lounge. Secure parking for cars and close to beaches, restaurants, golf course, airport and entertainment complex makes Carslogie House an ideal venue for the discerning traveller. Malaria free game reserves are within an hours drive from Port Elizabeth. The Addo National Elephant Park and Shamwari Game Reserve are also firm favourites for visitors to our area. 36839 page views since 05 Jun, 2003. Last updated on 06 Jun, 2018.